There are some curses, abhorrent to all people of good sensibility, that are sometimes laid upon the Souls of those recently departed … and that most often by the hand of a sorcerer or black magician, to chain their ghosts to the very grave itself, so that they may not wreak vengeance upon those that have destroyed their material form. I have heard, for instance, of folklore that a man might ‘lay the ghost’ of his angry wife by forcing a nickel into her throat. This is but a rough country superstition, or course. Yet it is a little similar, in emotional energy, to those dreadful curses laid by the seasoned black magicker or sorcerer. Such a curse of enchainment to the grave is of the vilest sort, and quite the opposite, in tenor, of the intention proffered by ministers of every Christian church through prayers for the dearly departed. “For many years, rumors of a ‘curse of the pharaohs‘ (probably fueled by newspapers seeking sales at the time of the discovery) persisted, emphasizing the early death of some of those who had entered the tomb. A study showed that of the 58 people who were present when the tomb and sarcophagus were opened, only eight died within a dozen years. All the others were still alive, including Howard Carter, who died of lymphoma in 1939 at the age of 64. The last survivors included Lady Evelyn Herbert, Lord Carnarvon‘s daughter who was among the first people to enter the tomb after its discovery in November 1922, who lived for a further 57 years and died in 1980, and American archaeologist J.O. Kinnaman who died in 1961, 39 years after the event. — from “Tutankhamun,” in Wikipedia, https://en.wikipedia.org/wiki/Tutankhamun ..
Was it the ghost of King Tutankhamun himself that did these dreadful deeds? Had he been poisoned? Could he have been a great sorcerer, who enchained a powerful spirit … perhaps an Ifrit, the most powerful and dangerous of the Jinn … or perhaps enchained a Demon, one of the Big Bads … which turned the tables and usurped his will, till it frightened his wife, Queen Ankhesenamun into poisoning him? Might the presence of the king’s two stillborn children in his tomb point to the cause of his demise at 9 years of age? Could it be that his wife, who herself was of royal blood … her parents having been the famed King Akhenaten and Queen Nefertiti … was impelled by such grief at the stillbirths of two children to end his life? Might the mages of that day have considered the birth of two stillborn children an evil omen, and swiftly followed up with murder, entombment, and enchainment through a magic spell placed upon the king? Why was Tutankhamun’s heart … an organ so vital to the resurrectionist spiritual tradition of Ancient Egypt … missing from the canopic coffinettes? MIght he have been murdered, and his heart stolen by a steely-willed pretender to the throne? Might his embalmers have exercised tact regarding this, glossing over the all important absent organ so as to present the kingdom with a standard-seeming burial? Here’s another mystery: Earlier this year I went to the California Science Center exhibit “King Tut: Treasures of the Golden Pharaoh,” https://californiasciencecenter.org/exhibits/king-tut-treasures-of-the-golden-pharaoh .. Image: “Tutanchamonuv Sarkofag,” https://i.pinimg.com/originals/ce/07/7f/ce077fc2a868788f798c35914f883f94.jpg .. 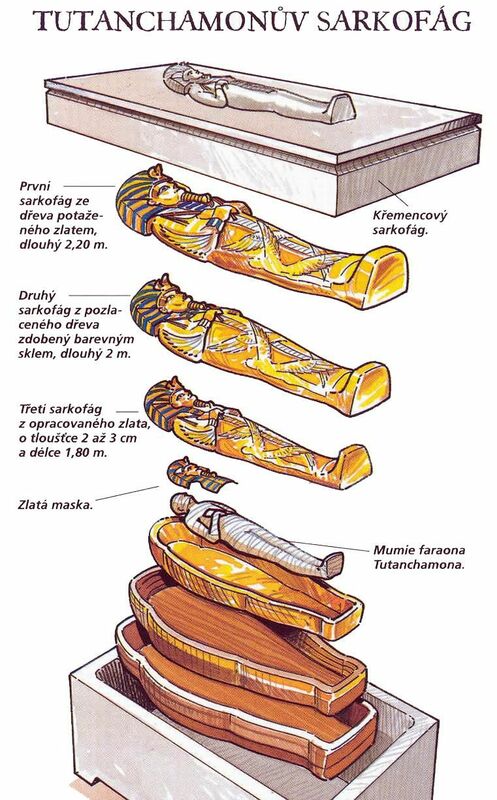 However, it seemed to me that, in the video, there was an extra layer between the mummy and the first sarcophagus. What I recall was a layer of magical markings … maybe representing something painted on the mummy’s wrapping? And the feeling I got was that these markings were magical signs … not the usual sort of magical signs, intended to help a deceased king navigate the pitfalls of the afterlife, but rather enchainment curses to keep him in his tomb, and not out there in what had been his kingdom, hunting down and haunting those toward whom he might have ill feeling. The odd thing is, though, that I have been unable to find the nested coffins video online. To get an answer to my question … did I see a layer with magical markings on it in the video? … I would have to view the exhibit again. I have a feeling I may have seen the markings through psy, and not realtime. I have a precident for thinking this, in my own experience. Long ago I purchased a CD with didgeridoo music on it, by a well-known aboriginal musician. I was very into didgeridoo, and one day I sat down on the floor of my apartment, and played the entire CD very loudly. It put me into a meditative state. Then, in this peaceful state, I wondered: What is the musician saying, as he plays the instrument? Is he saying words into the didgeridoo, and then they come out beautifully morphed because of the instrument? My people. My people. My people. My people. The sound of that voice lives on in my memory. Yet, to this day, when I play that CD … no matter how loudly … I have yet, once more, to hear those words on the physical plane. This entry was posted in Afterlife - heaven - hell - purgatory, Big Bads, Black magician - subtle sorcerer - thuggee - drukpa (dugpa) - red hat - mantrik, Curses, Demonic realm, Egyptian religion, Ghosts - kama rupa, Jinn - ifrit - genies, Obsession - possession - entity attachment - exorcism, Prophecy - oracles - seers - mystery schools - cloud readings, Spells, Stories - myths - visions - legends, Stories by Alice and tagged afterlife, Ankhesenamun, Australian aborigines, Big Bads, black magic, black magician, California Science Museum, demon, Demonic realm, didgeridoo, Egyptian religion, Ghosts, ifrit, jinn, King Tutankhamun, my people, obsession, omen, possession, sorcerer, stories, Stories by Alice, Treasures of the Golden Pharaoh on 3 July 2018 by Alice B. Clagett.